We are proud to announce the first maintenance release for the 16.12 cycle. Besides the usual bugfixes and usability improvements this release also marks the official release of the Windows port. Last summer, thanks to a Google Summer of Code slot, Joseph Joshua started to work on a Windows port of Kdenlive. Vincent Pinon then continued to work on it and we are excited to offer today the much expected first version of Kdenlive for Windows. This is a first testing version, zipped in a folder that does not require an install. You must however separately install FFmpeg, following the simple instructions provided on the download page. Packaging effort is also going on the Linux side, with an up to date Appimage and *Ubuntu PPA containing the latest release, so you have no excuse not to try Kdenlive. 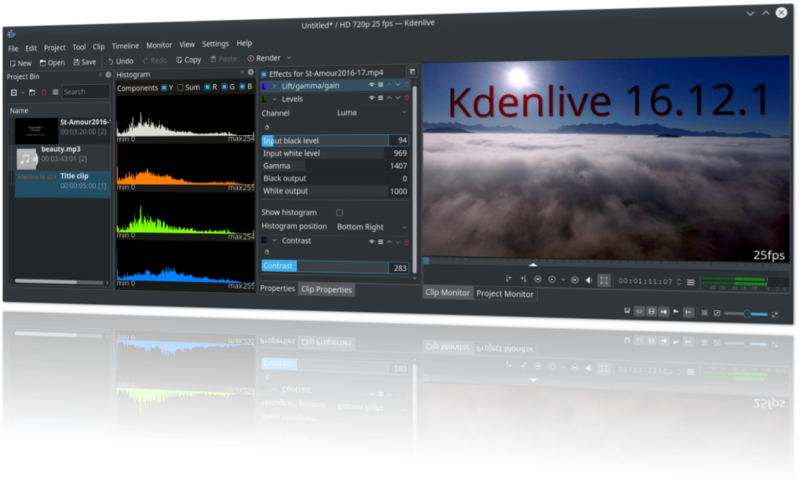 Kdenlive is an open source video editing software, based on the MLT framework and FFmpeg libraries. We are a small team and are always welcoming new contributors. We hold a monthly IRC Kdenlive café where users and developers meet, and you can also exchange on our forum or on our mailing list. Some great tutorials are also available from the toolbox section of our website. We are part of the KDE community, which provides, among other, all the infrastructure for Kdenlive. More than 25 bugs were fixed in this release, as well as a few usability improvements. Re-introduce transparency slider in titler background color. Commit. Disable delete tmp folder button if no folder exists. Commit. Correctly label missing playlists on document opening. Commit. Fix another possible corruption when relocating project folder. Commit. Cleanup mini timeline and keyframes in rotoscoping widget. Commit. Rotoscoping: fix color, icons and control point activation. Commit. Fix possible issue when opening moved project. Commit. Fix possible corruption when opening doc with slowmotion clip. Commit. Fix path & lookup for pattern in slideshow. Commit. Fix size slider not updating in animated parameter. Commit. When possible, enforce breeze or fusion style on Windows (fixes color issues). Commit. Fix standard DV profile not selectable unless clicking on interlace. Commit. Switch to frei0r.alphagrad for effect compare (faster & available on Windows). Commit. Warn before deleting used clips. Commit. Use AppDataLocation instead of deprecated DataLocation, remove useless Windows hack. Commit. Fix translation of wizard warning. Commit. Fix “go to previous keyframe” not going to clip start if no keyframe at start. Commit. Fix image / color clips if defaut duration is set to 1 frame. Commit. Fix detection of MLT in current directory (Windows). Commit. Load KIconTheme after DBus start (fix Windows icons). Commit. Do not reset keyframe type when editing effect with only one keyframe. Commit. Disable trim window shortcut since feature is unstable. Commit. It’s interesting that for years, Adobe has been telling us, “if you want to use Premiere, just use Windows!” and Apple has been telling us, “if you want to use Final Cut, just use a Mac,” but you guys aren’t willing to say, “if you want to use Kdenlive, just use Linux.” I guess that makes you the bigger people, but I hope you don’t start to prioritize the Windows version as it gets more users than the Linux version. I’ve seen that happen with some other projects that started out as Linux-only, and we really need Kdenlive in order to be a contender in the video production space. I hope you understand that this is a big step and people worked hard to achieve it. It will make the project grow as well both in users and devs hopefully. Thanks for your concern though, but where have you seen this happen and what makes you think we are going to do that? I’m glad to hear that the Linux version will remain a priority. However, I do agree that a Windows version might bring you more developers. I’m a big fan of your work. I contributed to your crowdfunding a few years ago and would be more than happy to do so again as Kdenlive has been a great boon to me. Thank You! This is something I have seen more than once. GIMP for example went from working perfectly (albeit missing some features) on Linux whereas there was always a bug or two to get used to on Windows. Last time I used Blender (quite a while ago I admit) the Windows version was flawless yet trying to do the same things in Linux gave me loads of problems despite it being pure Unix for the first few released. This is something I have definitely seen more than once so can well believe the original poster has as well. Hmmm, never seen that. I’ve met many of the GIMP devs and all use Linux… Don’t think they would let that slip. Also never heard such a thing in Blender. One thing which happens a lot though are distro packages being broken or shipping with older libs and might cause problems. This happened a lot with Kdenlive with distro shipping different versions of MLT and in some of them Kdenlive was buggy as hell. Not discarding your experience here just but trying to find a plausible explanation. Rest assured that this will not happen with Kdenlive though. Invalid Clip – Kdenlive. Clip is invalid and will be removed from the project. I get this error when importing a slideshow clip, regardless format. I have tried jpg and png. FFMPEG is installed correctly and Kdenlive is properly compressing H.264 video files. You need to file a precise bug report, read the instructions on our web site. Make sure to include an example image clip that is flagged as invalid with your concise report, so we can try to reproduce. I ve the same problem did you get anay solution? I have just came across this bug. Can’t import a slideshow clip in the Windows release. Just found a workaround: when importing the slideshow clip, use the alternative option “filename pattern”. For this, you have to rename your sequence in consecutive numbers and Kdenlive will pick all of them up and avoid the filename bug. You can do the sequence renaming with e.g. FreeCommander or XnView. Also have this bug. But only when using MIME type. In windows, just run program as administrator. Thanks, Fatih BAHÇECİ. Switching to admin did the trick. Totally agree with Jacob’s comment. Really whats the incentive for this? Given that the KDenLive team comprises just two developers and a handful of testers/bug fixers all I can see this doing is taking up more of their limited resources which would surely be better focussed on developing KDenLive into the reputable and contending ‘linux alternative’ video editor that it aspires to be. If you want the best of what Linux and Windows have to offer, then dual boot. One important reason is to allow those users who need to work with Windows working with fine video FOSS. Sometimes, you cannot avoid Windows, so being able to move a Kdenlive project from, say, Linux to Windows and back again is IMHO a great step forward. Can we have GPU acceleration on Windows ? On full HD clip, putting effects (like Curves) drops the FPS pretty quickly. The question here is rather what the OpenGL support of the graphics card vendors is worth on Windows. From the talks given by several people, GPU acceleration isn’t exactly a worthwhile goal unless MLT manages to run its transitions and effects inside the GPU. Everthing else will be worse than CPU, as a mixed setup would constantly shuffle frames around between the CPU and CPU instead of crunching on the pixels. Thanks for that perspective TheDiveO, which I can well appreciate – the proviso of course being that it is, or will be possible to seamlessly move KDenLive projects between the Linux and Windows environments without compatibility issues. If that is indeed the incentive and the direction that the development team are taking KDenLive, maybe it would help if they articulated that. I don’t know, having done the hard-work in creating the Windows port, is this something that can now be easily maintained and co-developed in parallel with the linux version ? Unfortunately (very unfortunetaly) I found a solution to the problem I have in Windows to move the timeline marker. It is to turn on GPU processing. yet. It’s turned off. Greyed out. The PPA is not yet updated. Thanks for the effort. I hope that with the port to Windows, more people use it, and at the very least, Kdenlive will become the Gimp of the video edition. I think a lot of people seeing this appear on the Windows side of the fence would be looking at it in terms of a reliable and comprehensive, open source (any yes, cross-platform)alternative to the commercial NLE suites that are out there. KDenLive already has a number of pro-level features that would separate it from the consumer level crop – videoscopes, usable Curves and now even LUT import. Please don’t turn it into Hitfilm Express clone. Hitfilm Express is pretty good – but hell, it’s available on Windows. Linux is missing a decent FOSS NLE and Kdenlive is almost there. In fact, it’s easily good enough for my daily work now and I’ve managed to dump the damn “shark”. If I had to go out on a limb here, the one thing it could use is a better name… (Sacrilege I know – don’t all jump on me here) but this K(bla-bla) was all cute and clever when KDE first dropped but we’re way beyond that now. Branding is something I’ve worked on for a couple of corporate clients and I’ve seen people glaze over when they see stuff like this. Hell, even the Linux penguin makes the suits shudder at times. What’s in a name you angrily demand? More than you might imagine – humans are an odd bunch. If I showed you two shapes and said, “One of these is a ‘kritch’ and the other is a ‘woolumra'” you would instantly know which was which. This is a well-known experiment in marketing psychology and something I would urge the KDE devs to familiarise themselves with. While you’re at it, read “Thinking, Fast and Slow” by Professor Daniel Kahneman – before you shoot me down in flames. It will change how you think. No need to shoot you ourselves as this will be done by those others keeping on advising us that we must do (their) “better branding”. Please excuse me while I enjoy working with Kdenlive to realize my ideas. My audience has never worried about the names of my tools. Maybe I’m lucky. Hitfilm is primarily a compositor with some editing capability for creating ‘fan-films’ and doesn’t even come close to professional grade, even the precociously overpriced Pro version. It has no scopes, extremely limited render options, uses an outdated Main Concept H264 encoder and clamps everything to Limited (‘broadcast’)16-235 range, which is the least desirable outcome for video shot with full range (0-255) YUV luma as most DSLR/Hybrid cameras do. KDenLive at least distinguishes native (yuvj420p-flagged) full range YUV material on input and compresses to Limited range instead, which is a better outcome provided full range can recovered on output, and presently that is only possible with (custom) H264 (x264) render formats by setting the yuvj420p pix_fmt. IMHO what KDenLive really needs is the option to process at Full and Limited range levels, like Vegas Pro has ‘Studio RGB’ and ‘Computer RGB’ and DaVinci Resolve has ‘Full’ (Data) and ‘Video’ levels. That alone would set it a breed apart from the other linux editors. Add to that 10-bit depth support and 32-bit float processing and I think KDenLive could attract serious pro-level interest in the Windows and Linux domains. So yes, the release of a Windows port is great, but I do think the KDenLive team need to consider these other advancements as well. Just saying. We are currently focusing our efforts doing a refactoring of the timeline code to be able to add advanced editing features, a better transitions infrastruture and further down the road even an audio mixer, so we have a defined road map for the coming features but please take your ideas to the forum so we can consider them in the future as well, if you feel they are important. Well, as TheDiveO might recall, the way KDenLive handles luminance levels with different input formats was addressed (at length) on the forum some while ago. But, as you suggest, perhaps now would be a good time to revisit that subject with a formal feature request. Given the increasing trend to shooting video on DSLR and other hybrid cameras I think there is fundamental and pressing need for KDenLive to handle “full range” material correctly. Even consumer-level Windows editors like Sony Movie Studio do so by default. So I wouldn’t exactly call this an advanced feature. So by that are you saying that I’d be wasting my time making such a request on the KDenLive forum or is this something that the KDenLive team would pass upstream to the MLT developers if they considered it was important enough ? MLT is the engine inside Kdenlive that does the video and audio frame processing. Kdenlive is the editor around it to set up the sources, cut positions, and so on. Thus, the topic you are addressing falls into MLT’S ballpark, together with ffmpeg. I fully understand that, but it doesn’t answer the question I was asking, which is in essence – how else can improvements be brought about at the higher MLT level unless there is a channel for feedback of needs expressed by users of the utilities it serves ? It’s a basic principle of quality improvement in any system. Anyhow, the only reason I brought this up is because several commentators expressed their needs and aspirations for KdenLive – Jacob “a contender in the video production space”, yourself “a fine video FOSS”, Farid “hopes it becomes more like Blender”. I merely gave an opinion on what I believe is still needed for KDenLive to become a high level, contemporary NLE that truly leads the field in the Linux domain, first and foremost, and a contender in the Windows environment that people at all levels of video production might seriously consider. Like I said earlier, with this first release of a Windows port, perhaps now would be a good time for the KDenLive team to articulate what KDenLive is to become….the vision so to speak. We have the forums and bugtracker to request features and are always open to user feedback, so if you have any ideas you are encouraged to share them with us… what we were trying to tell you is the feature you requested is to be made to the MLT project. One of the bugs that really caused a crimp in my shabby workflow has been fixed. Thanks fellas. This is awesome! I am teaching media courses at different schools and have only been waiting for a NLE that is powerful but also free so that schools and students can install and use it. I will now use Kdenlive in my courses and donate for every course I finish! As you can see here in other replies, no. If people don’t use Kdenlive because of the name or won’t be attracted, then that’s not our problem. This has been discussed many times before. Everybody finds another name cool, so please enjoy inventing cool names. But don’t expect that a significant number of other people will find this name cool. Oh, and then you’ll need to check that your name doesn’t conflict with some registered name. Excuse us while we enjoy actually using Kdenlive instead of dealing with this ain’t a cool name distraction. I’ve always thought the name KDenLive is very cool cool – in fact it’s what first drew me to it. But seriously, I wholeheartedly agree with TheDiveO. What’s more to call it something else would be a betrayal of it’s heritage. Package installed from stable ppa crashes immediately under Ubuntu 16.04, presumably while trying to load something related to OpenGL. I am using NVidia graphics card with proprietary driver. The snap package launches without crash, but is only 16.12. Users with Nvidia cards have experienced this crash. It has been fixed upstream if you want to try the testing PPA. Some distros like arch have also fixed this. Otherwise maybe be best to wait for 16.12.2.
b- Install the kdenlive-testing (or kdenlive-master) PPA. c- Use the 16.12 snap. The kdenlive-stable PPA has also been updated with this patch. The link of the latest release (16.12.1-2) is broken. I have downloaded this version by altering the url, but this package throws a number of missing dependencies (MLT, frei0r) at me on launch, after which I can only abort. Version 16.12.0 didn’t do this. You might want to have a look at that link again. Appimage still wasting an awful lot of CPU when idle. The last correctly behaving one was alpha1. It would be much better if attention is paid to improvement of stability rather than porting. From my several decades long actual experience, porting improves stability. The simple rationale: more system variance, more users, so this will at first look ugly, as more hidden bugs get uncovered. But it also leads to faster fixes, rapidly improving overall quality. And if you are anxious about stability then give us a helping hand. For instance reproduce bugs and regressions using minimal projects, so they can be fixed. To all people complaining about the windows version: it’s a good thing cause it creates an easier transfer to Linux. If I look at myself back in the day, I was busy with a lot of Windows only software and that basically kept me there. But I wanted to switch. I did for two days only to run back to Windows cause the the overwhelming amount of things to learn made me stressed and disheartened. But then there was GIMP, Inkscape and OpenOffice. My first step was to install those and download a Ubuntu theme for Windows (yes, I just wanted to be as much Linux as I could). Now I had software I could get to learn while still falling back on my Windows only software if I lacked the knowledge to do it in the new FOSS. In the end I learned GIMP, Inkscape, OpenOffice and now that I had my bases covered I could happily switch. No stress and I am grateful for the fact they were cross platform, so I could make this easy transition. I can only support this point of view! It was the same with me. I started with windows and I worked a lot with 3d software. One day I gave Blender a try and I fell in love with it. If it hadn’t been cross platform I had NEVER tried it! Because I knew that my favourite 3d package will perfectly work under Linux, the switch was MUCH easier. Now I’m running Linux and use almost only FOSS software in my daily work. I’m also monthly donating to 4 FOSS projects and even started contributing code to another. All of that would never have happened if Blender hadn’t had cross platform support. Who knows, maybe in the future some editors can tell a similar story because KDEnlive brought them to the FOSS world… So just relax and be happy about the port. In my opinion it’s a big step for KDEnlive. Thanks a lot to the developers! I had never heard of kdenlive until a few hours ago when a friend of mine called needing a little help with filming some instructional videos. He is using kdenlive on Ubuntu, but I noticed that you have a Windows version so I couldn’t resist the urge to install it and try it. I’m very impressed you guys!!! I’ve used Adobe Premier as well as other editors for years and I think you’ve done a good job here! And for being your first port to Windows, well…..I’ve been playing with it for an hour now, doing all the normal type of things I do with video editing, and it has been totally stable and was very easy to figure out. Thanks so much to the developers! I’ll be using kdenlive on my Windows 10 machine for the forseeable future simply because I so appreciate what you have done here! Seriously love this project – thank you so much to Jean and all the other developers involved. Whenever I view the Git repository I’m inspired by the amount of time and effort you’re putting into making this project what it is. It’s exciting to see the video production landscape changing and becoming a more open and accessible one. Kdenlive, Blender, Natron, Audacity, Krita, Inkscape, LibreOffice, Gimp – the list of powerful Libre software keeps growing and growing. Freaking brilliant! Kudos for the Windows version. Microsoft removed their free Windows Movie Maker app and this makes a nice replacement. The interface looks like a BlackMagic styled NLE but the choice of Theme and Styles makes it easily blend in with several vintages of Windows. I like the sophistication offered, but even the simple things familar to a Windows Movie Maker or iMovie user are all easily accessible. I really like the video track layering and composting.. stumbled into it while looking and it was just so blatantly obvious. i built a windows package for Kdenlive. Is it a good idea to share it with the community ? Didn´t support standart Video codecs on Windows like mp4. Invalid file. WtF? Useless software. That´s crap. Deletet. That is probably because you didn’t follow the install instructions correctly… either way this is still an ALPHA release. Well, I’m perfectly able to use my MP4 containers with H.264 footage with Kdenlive on Windows. What does this tell me? That I’ve read the installation instructions and followed them. But hey, badmouthing is better than checking one’s own abilities first. Hey, try re-downloading the ffmpeg file again, but make sure you choose the ‘shared’ option under the ‘Linking” column, because it default downloads the “static” option if you don’t choose something else. I had the same problem where I would get the message “invalid file’ every time I tried to add/import a clip. But once I got the static ffmpeg file, and followed the installation steps using content from the file, it worked! I don’t see any separate ffmpeg files to dl, and I’m also getting this error when I try to use an mp4 clip. I’ve already dl’d kdenlive twice as it didn’t dl properly the first time. Any ideas? Thanks! Teresa, I cannot reproduce. I downloaded the recent 18.08 beta for Windows, unpacked it, started kdenlive.exe, and threw an existing project containing lits of MP4 containers with H.264 video at it … without problems. Only for rendering, make sure that in the setting the correct paths to ffmpeg, melt, etc are used, and not the old one from the previously installed version. Unfortunately I am getting an error message saying is missing an icons package (Breeze icons), but most importantly missing: dvdauthor, genisoimage or mkisofs, vlc or xine. Kdenlive used to work fine… on windows 10. Now I get the message too, Breeze Icons missing. How to fix this? Don’t need no stinking Breeze icons. Go to Settings, uncheck Force Breeze Icon Theme, just below that–mess with Theme and also Style is another option. That will change color schemes and make icons visible. I’d post a screenshot, but there doesn’t seem to be a way. Still trying to find them and how to install. Pretty much worthless without them insofar as I’m concerned. Please report this issue in the bug tracker. why ??? mp4 H264 is standard. Did you install the additional ffmpeg files, and did you check that you installed them into the correct locations??? After you’ve correctly installed them, “standard” mp4 containers with H.264 video can be correctly read and also rendered. Whatever this “standard” is!!1!11! Mine won’t load ffmpeg, jpg or even a 44.1 16kHz wav file. So there are definitely still issues on Win 10. This has massive potential, I just found the software and I have to say it’s excellent, far above the competition. Thanks for bringing it to the Windows platform. I think you need to start the program, exit the program, and start again. I was having exactly the same problem and it went away when I restarted the program. Santi, I can’t believe restarting fixed it. Thanks for pointing this out! I can’t find a 32bit version of kdenlive anywhere. Does one exist? The Article implies it does. Would really love to check it out. I have been waiting for years for this but its seems I can’t find the 32bit version. Any link please? Hi. I have a problem with position and zoom. Under the image png is white line. I found out a thread with possible problem of MLT. It is possible fix it on Win10? I have always waited for windows release of Kdenlive. Unfortunately, my pc is 32bit operating system and I was not found 32bit version download link. Please suggest me the download link of 32bit operating system. As far as I know there is no intention to ever work on a 32bit Windows release. This is totally unusable. I have made a very short test video, and added some basic effects. The memory occupation starts at 490MB. As soon as I browser through the clip, the memory consumption jumps to 1.9GB, and more (eventually it takes up all the memory). When I close and open again the project, it starts again at 490MB, but as soon as I do anything, it jumps again and fills all the available memory. Please fix all this nasty memory leak. How much RAM does your machine actually have, that is, what does eating all memory actually mean? A 2GB machine or an 8GB machine. If rendering does constantly allocate more memory then that *may* be an indication. However, without any specific project to reproduce, it’s impossible to see whether this is indeed an allocation bug. As for the rendering process: you may have fallen victim to virtual memory consumption equating real memory consumption. Also, Kdenlive needs framework libraries, Qt and KDE frameworks 5 in particular. Kdenlive isn’t directly using the dying Win32 API but is multi platform. The price is higher memory usage on some systems, so if that is a problem to you, then go for commercial solutions. And then you add your bold claim that these are memory leaks. Can you actually prove this? If yes, then we would ask you to send in fixes for the leaks you are stating. Thank​ you very much for positive cooperation. For your reference: I tried reproducing your issue with one of my existing projects with 11 video tracks and 2 audio tracks. Timeline length is 12mins+. 81 bin clips, totalling at 800MB+. When playing the project in the timeline, I don’t notice any obvious memory leaks. This doesn’t mean that there may not any issues, it’s just that a rough “fix all this nasty memory leak” requires civil help from the users, such as meaningful descriptions and example projects that trigger these bugs. The memory leak issue also used to affect me in Linux, whenever I rendered a file, I think it was mpeg, the entire 16GB memory would fill up. I changed render to mp4 and no more problems. I have a problem with position and zoom. Under the image png is white line. I found out a thread with possible problem of MLT. It is possible fix it on Win10? I have a problem with the effects. When I’m adding for instance slow down effect to the video clip and set in example 50% of speed – it wont works !! the speed effect is buggy so please don’t use it, this issue is being fixed though. Please use the forums to get help, also note that there is a newer windows version. Note that the windows port is still in a beta phase. I found the solution : the problem happens when there are non usual caracter in the name of the file or of one of the folders (i.e. accents like é è …). There are two issues when you work with the tools. First of all, You use Windows 64-bit? If no, then you currently have no chance or you find someone to compile for you. Second, If you use 64-bit Windows, then the folder? It is suggested to work with an independent one as program files blah blah blah has restrictions just like linux when you try to copy something into or flagging something to be removed from. Since I’m testing rendering ability, I am still finding why won’t work as I expected as I believe, MLT is just a door for telling ffmpeg how to do while providing necessary to do the job. If I set ffmpeg_g (10-bit) for it, if in x264, then should be automatically switch to 10-bit while the play, probe is using zeranoe’s. To cut a long rant short: MLT isn’t a front-end to ffmpeg, check with the MLT project’s development site. As it is, there are discussions about 10bit mode, but it’s not yet available in MLT. This needs a lot of work in MLT, and then frei0r filters will need to be upgraded too. please give a download link for a 32bit edition of version 16 or any earlier version! Not available, because there never has been a 32bit version for Windows. Hi, I currently have two problems. First, if I render a movie in Linux and onto an external drive, I can run the movie on linux but when I switch to Windows on the same PC, I can´t see the file. I have tried to change settings in case of the file not being visible or anything like that, but it didn´t work. “This application failed to start because it could not find or load the QT platform plugin “windows” in “”. Available platform plugins are: minimal, windows. Also, when I try to export it in MP4 or YouTube, there is a red sign with a white cross on it, and the program tells me, that the package lib264x or so is not installed or something like that. Any tips on how to solve either one of these problems? This is the worst advice. this person finally asks the question I need answered, and you reference some other site, without the courtesy of a link. this is one of the first places people look for help. Without the ability to create mp4 files, the program is worthless to me. Also note that the Windows version is in an testing phase not ready for production. I was able to fix it by renaming the kednlive folder in %appdata% since I had used previous versions on the same windows system. I have got a problem. I update kdenlive to 16.12.1-2 but it crash with my project build on 16.12.1 How can I downgrade to 16.12.1 ? The project is currently at version 17.04.3 so you are way behind… please see the download page to get info on how to get the latest version for your distro. You can use the forums for further help. Também estou com este mesmo erro de melt(“Não foi possível encontrar o programa melt, requerido para renderização (parte do Mlt)”), mas, não sou da área e não estou conseguindo resolver. Seguiu as instruções na página de download?